After a somewhat disappointing choss-hike, I looked around for something a bit more like mountaineering, and a route on the König-Spitze or Grand Zebrú seemed to fit the bill: from a relatively high trailhead above 2000m, it climbed a couloir on the peak’s southeast side to the glacier on its east face. With snow/ice supposedly up to 50 degrees, it sounded like a potentially fun big-boots route. Unfortunately, the SummitPost page I used for the route is 16 years old, and does not reflect current conditions. What I found instead was a scree-chute leading to a bare glacier with a chossy rock bypass. I made it work, but it was pretty wretched business. Beyond the refuge, I followed a faint trail and line of cairns toward the Grand Zebru Glacier, winding my way through endless moraine. 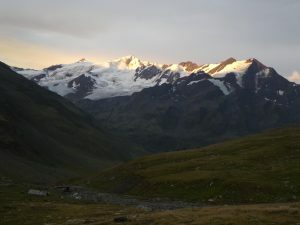 The trail gradually faded out of existence, and I continued stumbling up more moraine and then rock-buried glacier to a point where there was enough exposed ice to put on crampons. I dodged a few obvious crevasses, then followed a bit of boot-pack to the glacier’s upper edge. 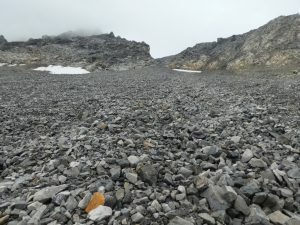 There I saw what I had feared: the “45-50 degree snow couloir” was completely melted out, exposing a huge scree-pile with rotten rock to either side. It was gray and chilly, and it even started to drizzle a bit; faced with a likely slog, I almost turned around, but managed to motivate myself to paw my way up the scree, then perform some careful chossineering on the rock to the right when I could. I eventually reached the east ridge, where I saw bare glacial ice on the northeast face, and a fixed rope leading up the rock to its left. I had brought the big boots, so put on crampons and started up the ice. However, with only one tool, it was not the most secure climbing, so I soon returned to the rock, finding a bit of hardware and a couple of fixed lines. The rock was class 3 covered in rubble, neither especially difficult nor fun. Where the slope eased, I found the ruins of some wooden structure, perhaps from the Great War, then followed an old boot-pack back onto the snow. The final summit climb was on rotten rock covered with a bit of fresh snow. I was in a mixture of clouds and mild graupel at this point, basically just heading up the path of least resistance, following fixed gear where I found it. There turned out to be another wooden structure on the summit, this one in better shape, but covered with “access denied!” signs. There was also a large summit cross with a register box. I signed in, then almost immediately headed down, since there was nothing to see. I took the rock route on the way down, freely using the hand-lines when available, then did some decent scree-skiing higher up. On the rock stretch from the lower structure to the top of the scree chute, I could not help knocking down all sorts of rocks, but I was confident that no one else would be out on the mountain today. Probably the best part of the climb was scree-skiing down the chute on mostly perfect ankle-deep rubble. Emerging below the clouds, I was pleased to find that the rain was holding off, and I had a limited view across the valley to the large Forni Glacier. The hut was crowded when I passed, with many people having ridden up on mountain bikes. I passed a couple dozen more on the hike down the road, and found the parking lot completely full of day-hikers. Despite the forecast, it actually turned out to be a nice day, so I hung out for awhile, then tracked down some WiFi in town to figure out an easy outing nearby. Hi Sean, I’m enjoying reading your posts and extremely envious of your adventures. I’m curious what your dirtbagging set-up looks like in Europe. Stay safe Sean. I hope your summer is going well, and look forward to reading about your adventures in Rogers Pass.